Yeah, but: Soft stainless – it's the "inox" part of the name. The Long Version: Until recently I've been something of a Swiss Army Knife neophyte, thinking that the boxy red-scaled models were about all there was. These are the knives that I remember my father owning, and they're nifty, with lots of options but not particularly practical or easy to carry. Discovering the multitude of thinner knives, especially the aluminium-scaled Alox ones, has been a revelation. 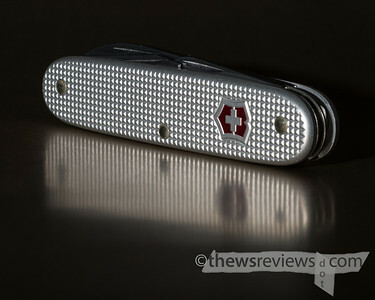 It's entirely posible that the Victorinox Electrician could be the perfect pocket utility knife. The Electrician has four tools: Large blade, sheepsfoot blade, caplifter, and awl. The aluminum scales don't include tweezers or a toothpick, and there's no cork screw, so right away a couple of the SAK calling-cards have been stripped away. There's also no can opener, which is odd for a model that has a cap lifter, and while I don't miss it I do wish that the Combo Tool that combines both tasks, and then some, was included in the cap lifter's place. The Cap Lifter, which is nominally for opening bottles, is something that I mostly use as a small pry bar and screwdriver for all of those screws that are sized for a coin. 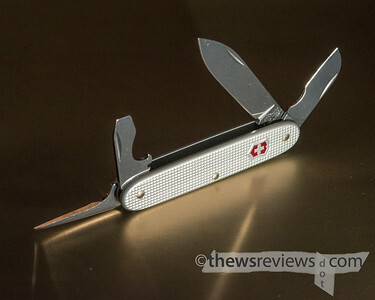 Pretty standard stuff: it locks at ninety degrees as well as straight out, and if you've seen a Victorinox Swiss Army Knife before, it won't hold any surprises. Similarly, the main blade is the typical pattern, and while this 93mm knife packs a slightly bigger punch than most, it's not all that unusual. The two greatest things about the Electrician are the sheepsfoot blade and the awl. Yes, the awl: it's that tool that normally sticks out of the back of the knife, and along with the Parcel Hook, ranks among the least useful of the common SAK tools. Except that, when I really do face the occasional need to punch a hole in something, the awl has no substitute. And the Electrician's awl is in-line with the handle, making it far more dexterous than the ones that stick out of the back of other knives, and it has an uncommon bend along the spine, replacing the nail nick as an opening method and making it extremely useful as a narrow wedge. About the only actual use I have for the Can Opener tool is as a staple puller, and the Electrician's Awl does a good job here instead. The awl also serves admirably as a rough blade for tasks that might nick the dedicated knives, like breaking nylon zip ties, and naturally it makes a very strong piercing tool. About the only thing it can't do is sew – for that the traditional SAK awl, with its eye, remains superior. That seems like a minor niche (rhymes with quiche) feature to give up in exchange for a genuinely useful tool. And then there's the sheepsfoot 'electrician' blade: this is what truly sets the Electrician apart. It's an exceptional utility knife, being long enough to cut through most material and short enough that it's a snap to use. The point being in-line with the blade – like on a box cutter – makes it excel at tasks like cutting boxes, breaking tape, and stripping labels, which is almost everything that I actually use a knife for when I'm at work. The length of the 'electrician' blade is just right: long enough to do work, and short enough to be easy to control. I prefer working with knives that have blades that are shorter than my fingers, as it's an intuitive size, and the electrician beats that by being shorter than my thumb. Combined with a large handle, this knife is easy and natural to us even when I keep it in my hand while moving boxes around. Of course, I cheat: the electrician blade has a crescent-shaped section that's designed as a scraper. It's sharply beveled but not actually sharpened; a couple of passes with a Spyderco triangular stone took care of that and turned it into the worlds' largest serration. Now when I slice through heavy plastic film – the wrap around six-packs of pop bottles, for example – the material gets cut even if it bunches up at the base of the blade. Like all of the super-stain-resistant SAK steel, the blades take a sharp edge and then don't hold it for very long, but the short blade takes just seconds to retouch on a pocketable DMT sharpening hone. And routing most of the heavy work to this utility blade leaves the large blade razor-sharp for the times when it's needed. Win-win. The aluminum scales also contribute to the Electrician's utility. The knife loses the tweezer and toothpick, but in exchange it gains a solid grip from a tough material that will only look better as it gains scratches and scars. The two-layer Alox knives are also only slightly thicker than a single-layered Cellidor knife like the Bantam, so even at its above-average 3.5" length, it's an easy knife to carry. 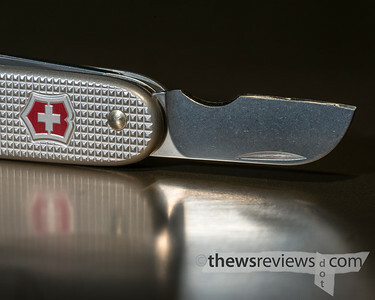 The Victorinox Electrician is also easy to carry for other reasons: it's a Swiss Army Knife, and despite its militaristic roots, they're generally pretty innocuous. It's going to be the absolutely last choice of the Mall-Ninja Tacticool crowd that make owning knives so obnoxious for those of us they call 'sheeple'. Non-locking slip-joint blades are fairly inoffensive and legal almost everywhere, while the Electrician is still big and solid enough to have real utility. 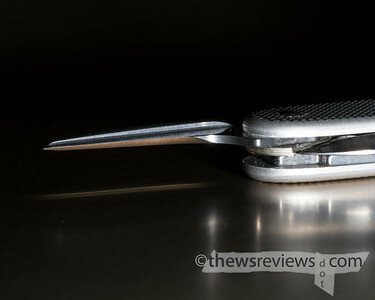 The last review I wrote was of my Chris Reeve Sebenza, which is a highly refined modern locking-bladed knife. It's possibly the best of its kind, and it's certainly the best knife that I own. But I could buy eight Electricians – $45 MSRP, dealers may sell for less – for what my plain Small Sebenza cost. Let me tell you, if I had found this little knife first, I might have saved myself a lot of money.